I’ve been working on the Data.Text library for my Google Summer of Code project under the wise supervision of Edward Kmett (but to be fair, Johan Tibell has also been helping me a lot, for which I am very grateful as well). The language used: for example, ASCII only takes up half the number of bytes when comparing UTF-8 against UTF-16, whereas some East-Asian characters take up three bytes instead of two. Tihs means that when a change is made, not all benchmark results change in the same direction. Hence, we aim for either making them faster, or keeping them as fast as they currently are, and have them use less memory. For the record, the test files used are an ASCII text file of 58M and a russian file of 62M. Note that while they are of (more or less) the same size, the ASCII text is a lot longer when counting characters instead of bytes (about twice as long). The first program I benchmarked for this blogpost is a simple one which converts a file to uppercase. Note the fact that the input and output needs to happen in UTF-8 (which is usually the case), but that this doesn’t make such a big impact as you might initially think: by using Stream Fusion, the UTF-16 version will also read the input from the ByteString directly. Because Stream Fusion plays such an important role in the first benchmark, Johan suggested I used another benchmark in which the Text values are used as keys in a Map – that way, they are forced to be reified as an UTF-8 encoded array. 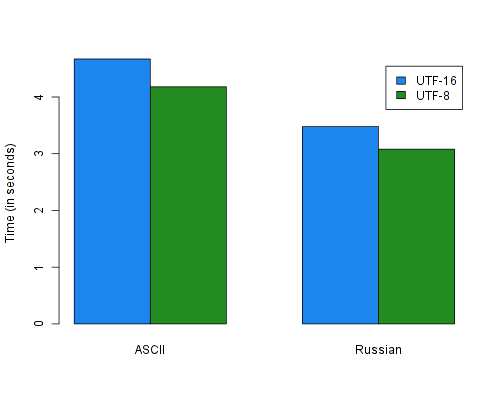 Word frequencies is a simple example of such a program; the next benchmark finds the most used word in a text (“the” for the English ASCII text and “и” for the Russian text). 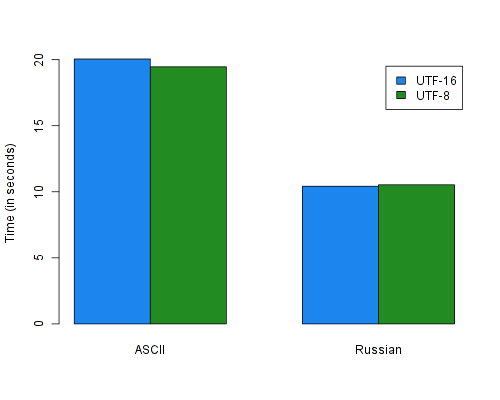 The results for this benchmark are very similar for both UTF-8 and UTF-16. This is reasonable because I wrote a new Ord instance for Text which performs better for medium-to-long Text values (e.g. more than 32 characters) but slightly worse for small Text values, because there is the overhead of an extra function call. This Ord instance is heavily used in the above benchmark, because of the Map container – But these results indicate that there is no real degradation here, so I can rejoice. There’s still lots of work to be done. In the next blogpost, I hope to talk about reduced memory usage and its implications.